USDJPY is under the influence of some economic reports such as Flash Manufacturing PMI for the US and Japan is publishing Flash Manufacturing PMI, Trade Balance and All Industries Activity m/m. This pair has been climbing up the ascendant channel since the beginning of May. 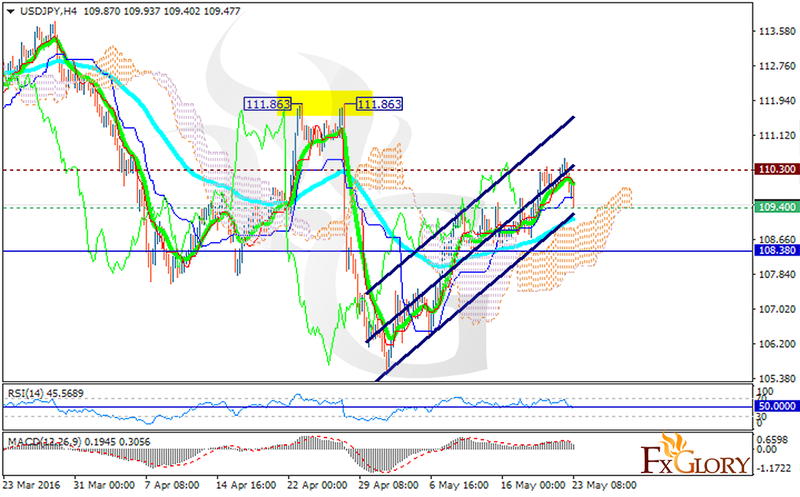 The support rests at 109.400 with resistance at 110.300 which both lines are above the monthly pivot point at 108.380. The EMA of 10 is located above the EMA of 75. The MACD indicator and the Ichimoku are signaling buy opportunity. The price is above the Ichimoku Cloud and the Chinkou Span. The Kijun-sen is showing a horizontal trend while the Tenkan-sen shows an upward movement. The MACD indicator is in positive territory and the RSI is staying in neutral zone. While these indicators are suggesting long positions the price is getting close to the support level and the support level breakthrough can push the price to lower ranges. Short positions are recommended with the target at 109.00.